One (1) LEGO System Town Set 6658 Bulldozer Original Instructions. - Looks new. Pieces are in mint condition. No yellowing. Never played with. - Instructions are in fair condition. - No extra pieces. LEGO CITY Crane set #7905. Radar stand pole and base were missing so replaced with similar pieces. Pilot boat mini fig body is generic black under life jacket not nautical officer. Two red ladder on base of one side of crane near wheels were missing and replaced with plain red bricks. 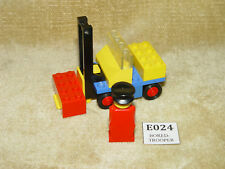 LEGO PART 3640c01. COMPLETE ASSEMBLY HINGE PLATE WITH ARTICULATED JOINT. All our genuine Lego parts are in good used condition. 1 HINGE (2 parts) SUPPLIED. COLOUR -BLACK. HUGE SELECTION OF COMPLETE SETS, PARTS & SPARES AVAILABLE. All our genuine Lego parts are in good used condition. GENUINE LEGO MINI-FIG ACCESSORIES. LEGO PART 6246f. COLOUR - BLACK. 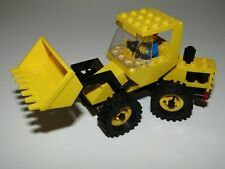 Lego 6532 Dumper Truck. Complete with figure and instructions. All in VGC barring a bit of dust! 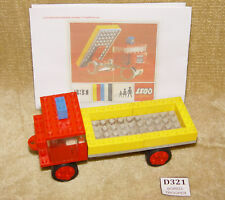 Please see our other items for loads more vintage Lego. THIS LOT CONSISTS OF A LEGO SET 6507-1 Mini Dumper AS PER TITLE. AS THE MAJORITY OF OUR LEGO IS PRE-OWNED, OUR LEGO GRADING SYSTEM IS Sets: Town: Classic Town: Construction THE PIECES MAY HAVE SCRATCHES, TEETH MARKS, SLIGHT DISCOLORATION OR NOT BE AS SHINY AS THEY ONCE WERE, BUT UNLESS OTHERWISE STATED THEY WILL NOT BE BROKEN AND THE PIECES WILL STILL FIT TOGETHER. All our genuine Lego parts are in good used condition. GENUINE LEGO MINI-FIG ACCESSORIES. LEGO PART 6246b. COLOUR - BLACK. GOOD CLEAN CONDITION. This Lego piece, would make a great addition to any Lego City or town. THIS LOT CONSISTS OF A LEGO SET 6535-1 DUMPER AS PER TITLE. AS THE MAJORITY OF OUR LEGO IS PRE-OWNED, OUR LEGO GRADING SYSTEM IS THEY MAY HAVE SCRATCHES, TEETH MARKS, SLIGHT DISCOLORATION OR NOT BE AS SHINY AS THEY ONCE WERE, BUT UNLESS OTHERWISE STATED THEY WILL NOT BE BROKEN AND THE PIECES WILL STILL FIT TOGETHER.